Italian yacht builder CRN, part of the Ferretti Group, launched the refit of the 46 metre superyacht Eight this morning (28 May). 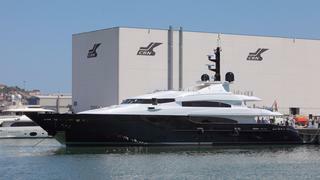 This re-launch marks CRN’s first foray into refits, a new market for the custom yacht builder. “This is an important and strategic moment for our shipyard as it marks the first step along a new development path, the refitting of CRN yachts, which we believe can be an interesting opportunity for our company's future,” said CRN Chairman and CEO Lamberto Tacoli. “The Eight is a first outstanding example of this, and we are all feeling great pride." The blue-hulled Eight was designed by CRN’s in-house engineering department in collaboration with Italian designers Nuvolari Lenard, who were responsible for her exterior styling. Eight has a contemporary, sophisticated décor and accommodates up to 12 guests in a master and five VIP cabins. The refit included refreshing Eight's hull paint and updating her interior. With twin Caterpillar 3512 B engines, she can run at a top speed of 16 knots. Just weeks ago, CRN launched the military inspired 55 metre yacht Atlante. Other new yachts in the works at CRN are a 74 metre due to launch in 2016 and a 46 metre and 77 metre, both due to arrive in 2017.